Additional photos of Florence and the surrounding area -- select Home (tab above left) to return to the home page or select Back (above right) to return to the previous page. 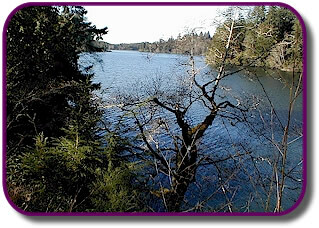 The Florence area boasts 27 fresh-water lakes and the Siuslaw River within 6 miles of Florence! Activities vary from clamming to superb fishing and water skiing. 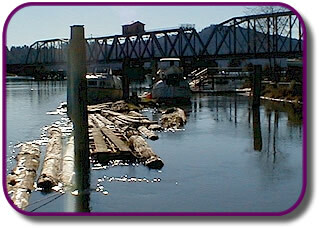 This picture is of a rotating train bridge located about 4 miles up the Siuslaw River from Florence. Just east of this location is where the North Fork of the Siuslaw joins the main Siuslaw River. The beaches in the Florence area, and extending to the south are expansive and allow for all the great beach activities, including just playing in the sand or taking a relaxing stroll amongst the dunes and numerous sea birds that populate the coastal areas. 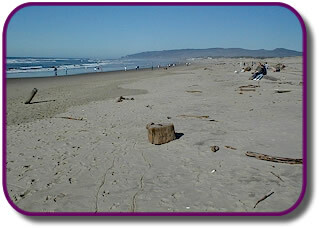 This is a picture of the beach near the North jetty in Florence. 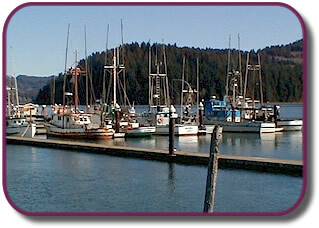 This photo is of the harbor in Florence on the Siuslaw River in Old Town. You can watch the fireworks on the 4th of July or moor or launch your boat here during the salmon fishing season in September and October. The Florence area boast 27 fresh water lakes formed by drifting sands just east of the ocean front. These lakes offer boating, fishing and great locations for a picnic or a lake front home. This photo is of a fisherman fishing in tiny Clewox Lake located in Honeymen State Park just south of Florence. It is said that many fish in the area will grow old never seeing a fisherman's lure! 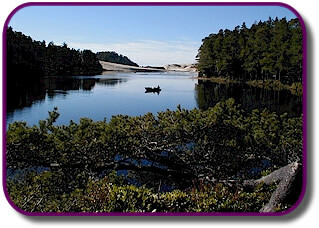 Opportunities including fishing in serene Lake Merced (shown here), or salmon fishing either in the great Siuslaw and Umpqua Rivers or offshore in the ocean. Additional photo of the Florence area are available by clicking Continue Tour.